Samira Ahmed was born in Bombay, India, and grew up in a small town in Illinois in a house that smelled like fried onions, cardamom, and potpourri. A graduate of the University of Chicago, she taught high school English, helped create dozens of small high schools, and fought to secure billions of additional dollars to fairly fund public schools. She’s lived in Vermont, Chicago, New York City, and Kauai, where she spent a year searching for the perfect mango. Follow her on Twitter and Instagram @sam_aye_ahm. An ABA IndieNext "Top Pick"
"For those of you who sometimes wish your parents would just let you run your own life, let Love, Hate & Other Filters be your savior." "Ahmed authentically and expertly tells a story relevant to today's climate. More than that, it's a meaningful #OwnVoices book about identity and inner strength that everyone should absolutely read." ​"​This intriguing coming-of-age debut will rival Thomas’s The Hate U Give with its sensitive and must-read tale of an Indian-American Muslim teen and her battle with Islamophobia.​"
"Books can teach you a lot about people, places and cultures; Love, Hate & Other Filters is one of those books. This book is relatable to anyone that has ever felt as if they don’t fit in or anyone who wants to learn to stop the hate . 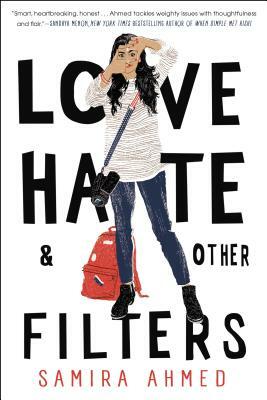 . . Love, Hate & Other Filters is 2018's most important YA novel." "[A] brilliant, heartbreaking, empowering debut." "A raw look at the cultural realities of violence and prejudice as well as the coming of age of a young woman . . . [Samira Ahmed] is someone to watch." ​"A​n entertaining coming-of-age story that tackles Islamophobia​." "​A breathtaking debut by an #OwnVoices author​." "If you're looking for a contemporary romance that doesn't shy away from the true experiences of the modern teen—prejudice, discrimination, violence, political unrest—this #OwnVoices book is perfect for you." "A promising debut novel . . . [Maya's] story of family expectations and her dreams is bound to strike a chord with almost every South Asian American." ​“The core relationships are authentic and memorable, and the conclusion is satisfying. A well-crafted plot with interesting revelations about living as a second-generation Muslim-American teen in today’s climate." “Samira Ahmed’s debut thoughtfully explores life in America through the eyes of a child of immigrants, the far-reaching effects of racism and religious intolerance, and the challenges of balancing personal dreams and parental expectations." "A coming-of-age story ripped from the headlines full of pop culture references, sweet romance, and a powerful message about what it means to be a young American (no matter the hyphens) in a climate of nationalism and fear, Love, Hate and Other Filters is a perfect choice for book clubs seeking to share relatable, relevant titles that spark discussion, or #ownvoices additions to school and library collections."